A Yankee fan named Stan recently visited Boston to find some changes had been made. Business owners who supported the Red Sox had pushed a bill through the Massachusetts state legislature. The bill said that Red Sox fans who owned businesses could refuse service to Yankee fans. This visiting Yankee fan tried to get breakfast, but was refused because of the NY symbol on his hat. He shed the cap and headed to the next diner. He was able to get seated and even ordered a meal, but was asked to leave when he removed his jacket revealing the star striped hat on a bat symbol he proudly wore on the shirt beneath. The fan decided to skip breakfast not fully understanding what was happening. He set out for some sightseeing. He stopped by the USS Constitution and the Old North Church by then feeling starved and strange from the glares he'd received all day. He had trouble hailing a cab and instead walked all the way to Faneuil Hall to finally buy some food. 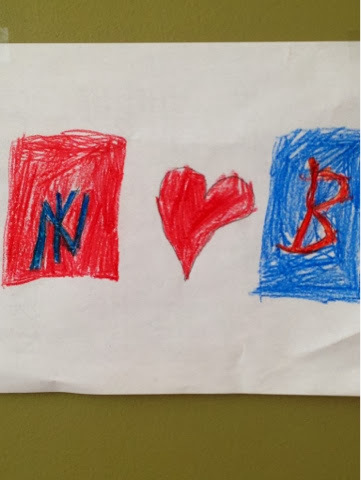 As he reached for the door to the marketplace, he noticed a posted sign stating that Yankee fans were not allowed in and his beloved symbols were cloaked the red anti symbol. The sign had a collection of flyers explaining the bill. He grabbed one heading back to his hotel to change for the need for food was overwhelming at this point. A Red Sox fan named Stu walking by saw Stan's weary face and got his attention. Red Sox Stu said he'd noticed what Stan was reading and explained that not all Red Sox fans felt that way. Red Sox Stu lead Yankee Stan to a pub a few blocks away. Stu bought Stan lunch and a beer. Then Red Sox Stu explained his theory on what was happening with Boston's discrimination. He said that while he loved seeing the Red Sox win, he genuinely loved seeing good baseball. Being unkind to someone who LOVES just as much as he does, but just LOVES something different just didn't make any sense to him. After lunch they shook hands and parted ways knowing they were like minded. Stan proceeded to his next tourist location proudly displaying his team's symbols. Fenway Park is a great place for baseball and he could not wait to see his team play that afternoon. Stan excitedly found his way to his seat past the hoards of screaming Red Sox fans. When he reached his seat, he laughed because Red Sox Stu was in the seat next to him. Now imagine that these two men were in Arizona. Imagine New York Stan was a gay man and imagine that Red Sox Stu was a religious man who cares about kindness more than any other religious belief. Teams don't have to hate when the love for the game remains the same.